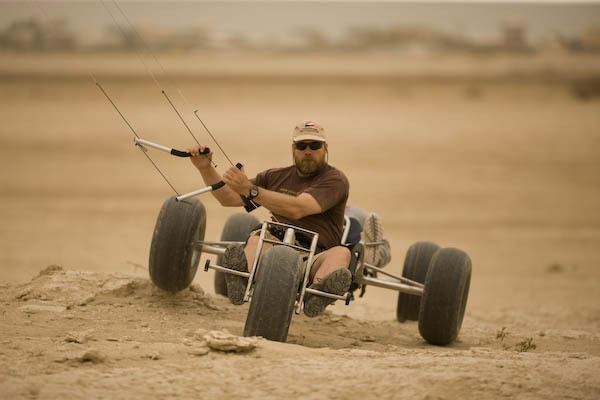 The Outlaw Buggy has been designed for expedition use. 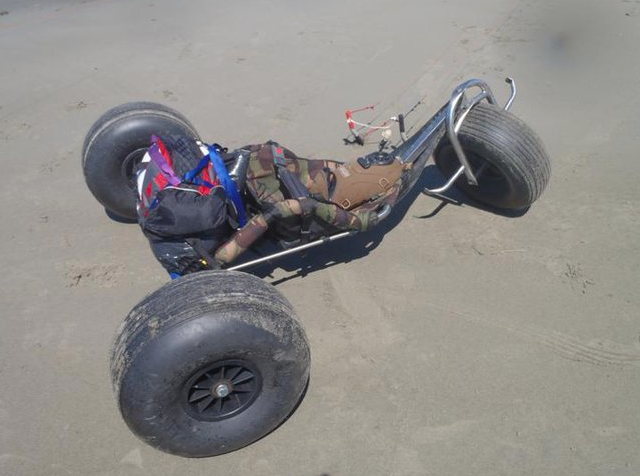 Generously supplied by Craig Hansen in New Zealand, these buggies withstood the rough terrain of the sahara, so we’re confident that they’ll be a match for the beaches and dunes of north east Brazil even without vehicle support. They’re made of 304 Stainless steel, with Big Foot Tyres from Starco and steel rims. They have fitted side pads, a durable long distance seat with drain holes and protection – obstacles hitting the bottom of the seat can be fairly painful at speed! The outlaw buggies have a light, rigid chassis and small footprint when taken apart which is useful for transporting them on the plane. Their construction is simple, using standard metric bolts, bearings and parts which will hopefully make any repairs easier to do, and there is dual height adjustment on the rear axle for handling rough terrain. Handling is aided by an anti torque down tube for holding maximum power without the front wheel washing out. With Big Foots this buggy will float with rider and gear, so this might come in useful with the various small rivers we need to cross! The tyres are coming from Starco in the UK, and we are treating them with special tyre sealant kindly supplied by Ultra Seal in the USA. This sealant protects the tyre and prevents punctures from rupturing the tyre. Craig Hansen told us the Mad Way South expedition to the Sahara would have failed without it, so we are lucky to also be sponsored by Ultra Seal – hopefully we won’t need our spare tyre! What size were the tires? 21×12-8? Hi Brooks, sorry for the delayed reply. I’m afraid I can’t remember the exact sizes but that sounds about right! Are you planning something similar? This is an epic trip. It is great to hear of people doing things just to see them done!